1. 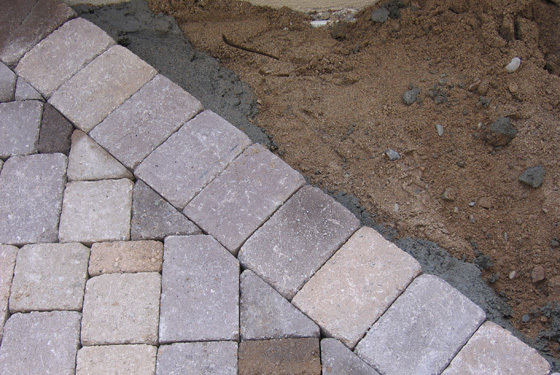 Excavation & Grading - We Excavate the new paving areas to the correct grades. 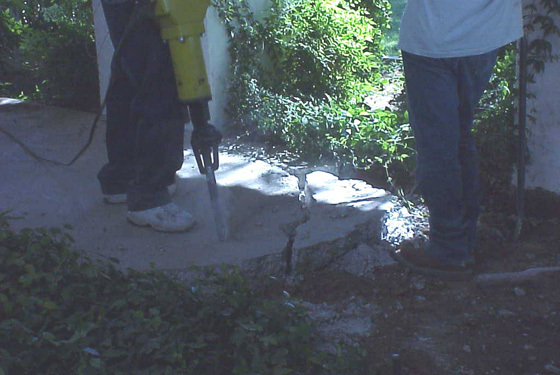 This can involve removing concrete, asphalt and soils. The material is hauled away. 2. 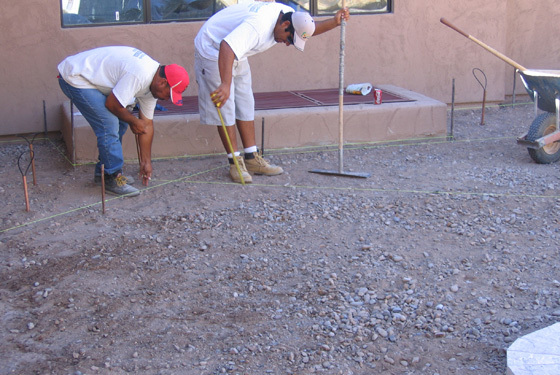 Grades - Our team of professionals expertly sets the grades for your new paving area. 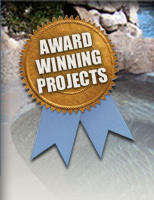 We are always mindful of water – even in Arizona – and we set our grades to ensure movement of water in the right direction. 3. 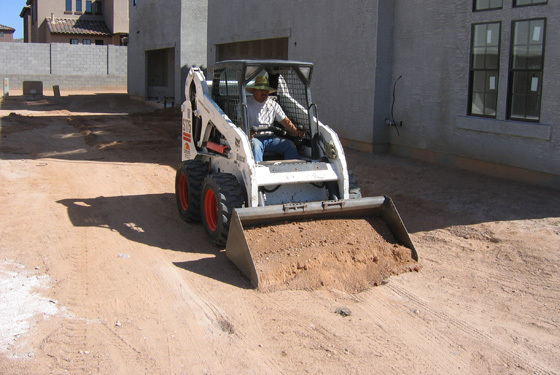 Compaction - After our grades are set, we compact the soils and then install our base material. 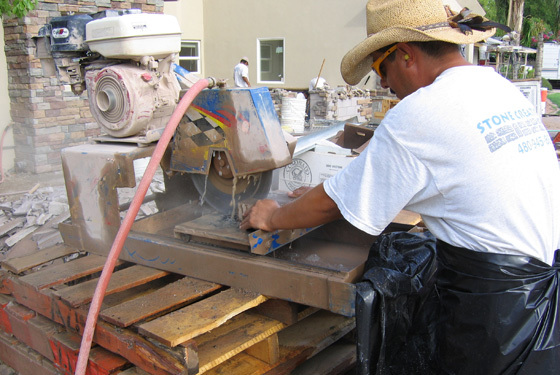 This compacted base material is critical to the overall performance of the whole paving system. 4. 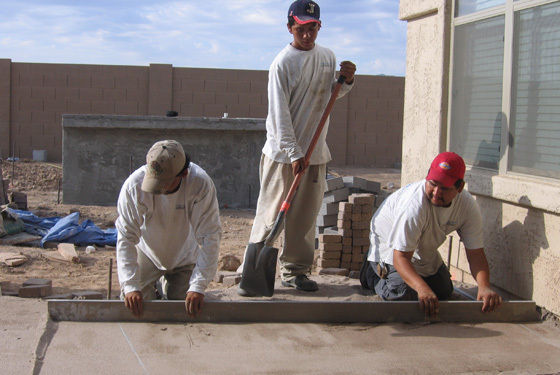 Sand - Once the base is compacted we add concrete sand and screed it to where it is perfectly level and smooth. 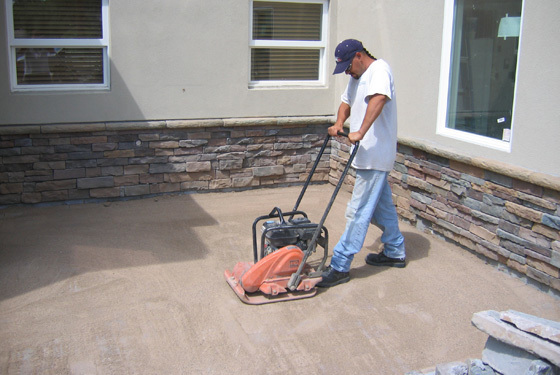 We use only 1” to 1 ½” of sand, as any more than that does not provide adequate strength and will result in problems later on. 5. 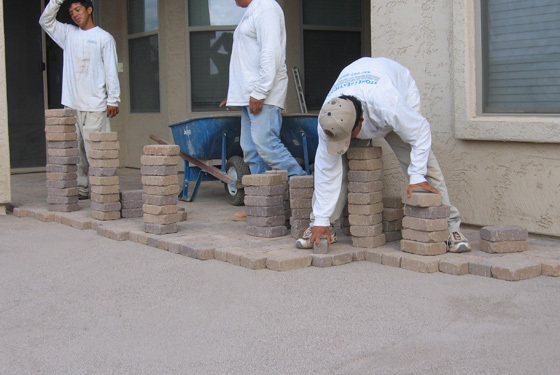 Pavers - Pavers are installed on the sand base. 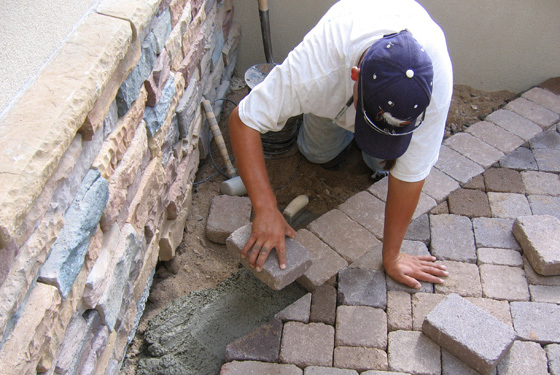 Pavers can be laid in a number of different styles and laying patterns depending upon your preferences. 6. 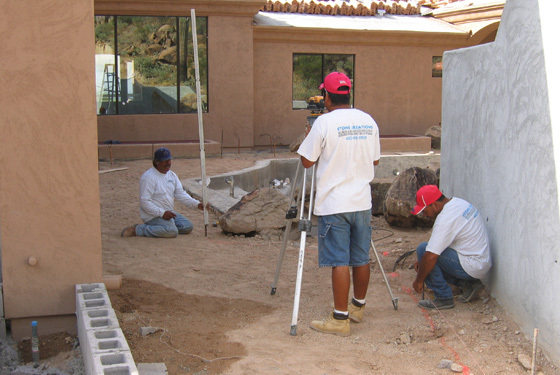 Install Soldier Course - Typically we install a soldier course of pavers around the perimeter of the project. This soldier course gives a finished appearance to the pavers. 7. Edge Restraint - The unrestrained border is then mortar set to prevent any lateral movement of the pavement. 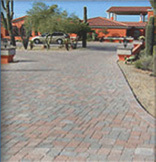 Our proprietary mix design ensures strength and stability of the border pavers. 8. 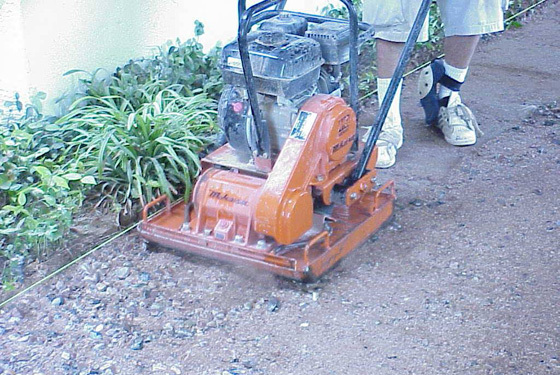 Vibration - We run a plate compactor over the pavers to drive the sand up between the pavers. 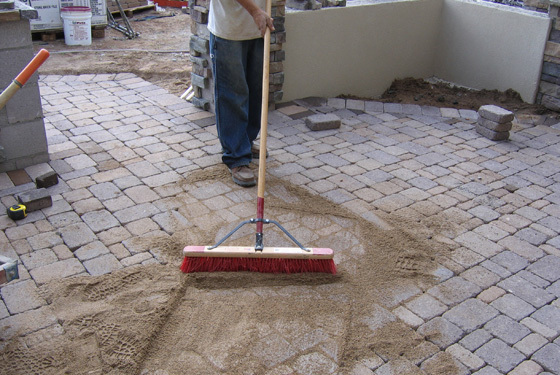 This sand is one of the key aspects to the interlocking of the pavers. The plate compactor is run over the entire pavement. 9. 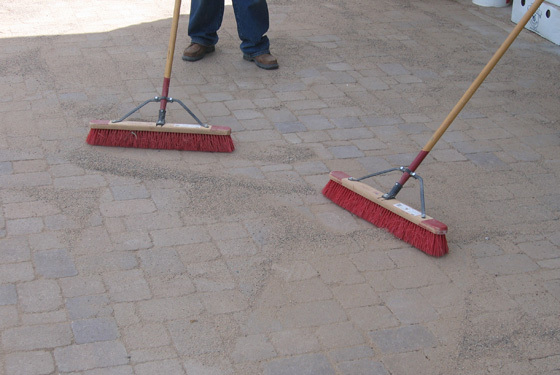 Joint Sand - We then sweep sand over the pavers and recompact the pavers. The sand fills all the joints and the whole pavement tightens up. 10. Clean Up - At the end of the project, the pavers are cleaned off , the debris removed and you are left to enjoy your new paving area.